My name is Joan Sharp, or to a lot of my regular customers they know me as Madame Pompador. I started this business in 1961. I started with $300.00 dollars and a burning desire to groom dogs and make them look beautiful. At that time cats were not getting their hair cut. I painted my own signs on the building, made my own thick towels, and made my own drying cages. I had been doing my own poodle for about 6 months when people were asking me where I got my dog done, and when I told them I was cutting my own dogs hair they asked me to do their dogs. Soon I had ten dogs every month and the customer numbers were growing rapidly. I was working as a waitress part time and at an insurance company part time. I knew that this was not what I wanted to do. I knew working with animals was what made me happy, so I took a chance went into business for myself, and 54 years later I am still in business. My son, Arthur and his wife Racine are working with me to bring to our customers the love and care we share for your pets and to the best of our ability to make your pets look as good as we can. We love animals of all sorts. Art has been working with dogs since he was about 12 , he started learning to groom them then, he does most of the large dogs and special baths. 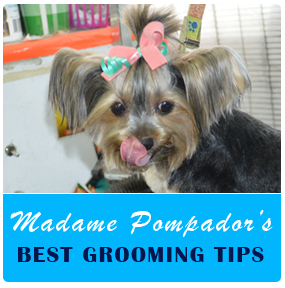 Racine takes a lot of pride in her work and has been grooming dogs for about 10 years. She first started working with hair at Cerritos College when she completed her course on Cosmotology. She was working with Art and myself part-time. It was after she completed the course that she realized she really loved working with animals more. She then came to work with us full-time. She has been working with us now full-time for over 10 years. She loves the animals and is an expert on grooming Yorkies and mixed breeds. We value our customers and want their pets to feel happy and comfortable when they are at our business.